Christian TV Host: Democrats Will Slaughter Tens Of Thousands Of Christians, Burn Churches If They Win - Joe.My.God. “They hate God. These people are against God. Every nation that has been taken over by Marxist-communists, they immediately kill the pastors. They immediately kill Christians. They immediately burn the churches. Why? Because the cross is their enemy. Their enemy is not the Republican Party. Their enemy isn’t corporations. Their enemy is the church. “They’re coming against the church and I’ve been warning people for years and years and years – you better get ready, you better be prepared, if these people ever get power, they’re going to slaughter tens of thousands of pastors, tens of thousands of Christians. They will spill blood in America. That is their purpose. That is their objective.” – Rick Wiles, speaking on his TruNews Network. PREVIOUSLY ON JMG: Rick Wiles declares that drinking water is cannibalism. Rick Wiles claims the Las Vegas shooting was carried out a “super secret gay Nazi death squad.” Rick Wiles declares that God punished Houston with a hurricane because the city loves “LGBT perversion.” Rick Wiles declares that Queen Elizabeth is a “satanic lizard person.” Rick Wiles declares that Bill Clinton is dying from a brain disease brought on by cannibalizing children. 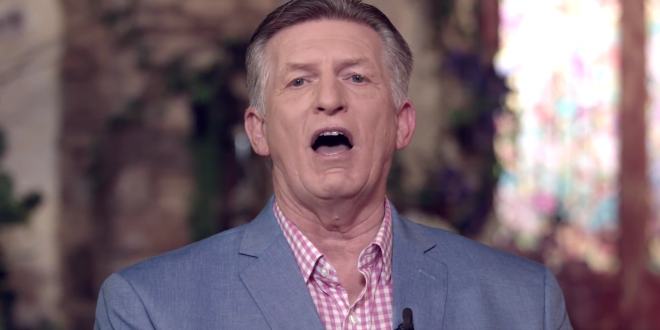 Rick Wiles declares that God’s love is “oozing” over America thanks to Trump. Rick Wiles prays that Hillary Clinton falls down at the presidential debate. Wiles declares that Satan is using Pokemon to murder Christians. Wiles declares that the “Nazi freaks at Target” will get American destroyed in a nuclear war. Wiles declares that God will murder the enemies of Donald Trump. Wiles declares that President Obama ordered the murder of Antonin Scalia as a human sacrifice to pagan fascism. Wiles declares that gay Nazis control America. Wiles renounces US citizenship because Obergefell. Wiles declares that God will destroy the earth with a “fireball from space” because of gay marriage. Wiles declares that God is killing chickens, bees, and pigs because of gay rights. Wiles declares that God sent the California drought because of gay rights. Wiles declares that Russia will nuke the United States because of gay rights. Wiles says God will destroy America and the survivors will be the “slaves of sodomites.” Wiles says ebola could solve “America’s problem with gays and atheists.” Wiles declares that MSNBC viewers are “demon-possessed fans of the anti-Christ.” Wiles declares that God sent a plague of locusts to Egypt because Obama.